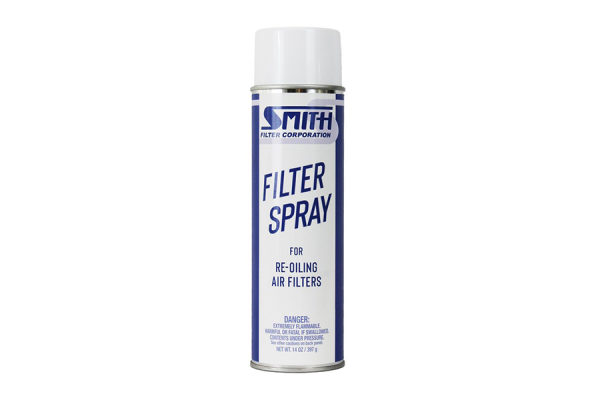 Smith Filter Spray is specially formulated to enhance the effectiveness of filters in heating, ventilation and air conditioning systems. When applied to these filters a tacky surface is created that catches and holds dust, pollen, spores and other airborne contaminants. The Smith Filter Spray is available in both 14 oz. cans and bulk. With the cans, on the average, you will use less than 1/2 an ounce of filter spray per square foot. One can will normally cover at least 9 – 20×20 filters. Spray sold individually or in cases of 12. 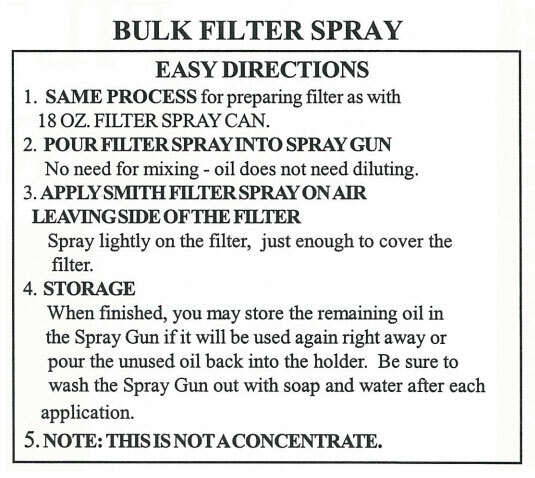 Bulk Filter Spray is available in 1 gallon, 5 gallon and 55-gallon drums. 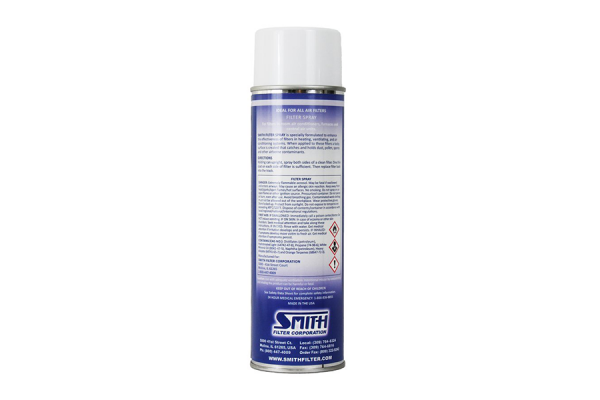 Applied with an industrial strength Spray Gun, this bulk filter spray allows the user to apply as much or as little as is appropriate for the application. These products are kept in stock, ready for immediate shipment. A water-soluble solution, the filter spray will also help in the clean-up of permanent filters. This coating on the filter prevents dirt buildup from adhering itself to the filter, allowing the contaminants to be easily washed away. Also, because Smith Filter Spray is water soluble, clean-up of the Spray Gun is simple too. Use vacuum or gently tap filter with the dirty side down. Shake filter and drain dry. Shake can before depressing spray head. Spray lightly on the filter, preventing oil from dripping or running off the surface. Turn can upside down and spray out excess oil in nozzle. Clogged spray hole can be cleaned with a needle or wire.